It was one of the foulest presidential campaigns in American history. The race for the White House in 1828 pitted incumbent John Quincy Adams against Andrew Jackson, hero of the Battle of New Orleans. This was the second time that Jackson and Adams had faced one another for the presidency. Four years earlier, the two had been part of a four-man race in which no candidate won a majority of the electoral votes. The lack of a clear winner threw the election into the House of Representatives where, after much political maneuvering, John Quincy Adams was declared the winner. The beginning of the 1828 campaign revealed little difference between the two candidates on the major political issues of the day - maintaining protective tariffs and encouraging national improvement. It became obvious that the race would be a personality contest and that Jackson had the clear lead. Faced with this reality, the Adams camp injected scandal into their campaign. Adams's supporters hurled charges of bigamy and adultery against Jackson and his wife Rachael who had been previously married. Jackson�s supporters retaliated with charges of adultery against Adams and his wife. The campaign descended into a mud-slinging contest. A reclusive woman, Rachael Jackson recoiled at the allegations. Many thought the slanderous attack hastened her death just before Christmas. Jackson won the election, but his wife�s death threw him into mourning. 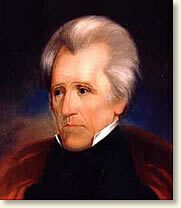 Jackson was America's first "Frontier President" � the first president who did not come from the nation�s east-coast elite. His victory was seen as a triumph for the common man and for democracy. The celebration of his inauguration was an opportunity for America�s ordinary citizen to rejoice. "Ladies fainted, men were seen with bloody noses and such a scene of confusion took place as is impossible to describe." Thursday morning. . . Thousands and thousands of people, without distinction of rank, collected in an immense mass round the Capitol, silent, orderly and tranquil, with their eyes fixed on the front of that edifice, waiting the appearance of the President in the portico. The door from the Rotunda opens, preceded by the marshals, surrounded by the Judges of the Supreme Court, the old man with his grey locks, that crown of glory, advances, bows to the people, who greet him with a shout that rends the air, the Cannons, from the heights around, from Alexandria and Fort Warburton proclaim the oath he has taken and the hills reverberate the sound. It was grand, - it was sublime! An almost breathless silence, succeeded and the multitude was still, - listening to catch the sound of his voice, tho' it was so low, as to be heard only by those nearest to him. After reading his speech, the oath was administered to him by the Chief Justice. The Marshal presented the Bible. The President took it from his hands, pressed his lips to it, laid it reverently down, then bowed again to the people - Yes, to the people in all their majesty. . . The south side of the Capitol was literally alive with the multitude, who stood ready to receive the hero and the multitude who attended him. . . When the speech was over, and the President made his parting bow, the barrier that had separated the people from him was broken down and they rushed up the steps all eager to shake hands with him. It was with difficulty he made his way through the Capitol and down the hill to the gateway that opens on the avenue. Here for a moment he was stopped. The living mass was impenetrable. After a while a passage was opened, and he mounted his horse which had been provided for his return (for he had walked to the Capitol) then such a cortege as followed him! Country men, farmers, gentlemen, mounted and dismounted, boys, women and children, black and white. Carriages, wagons and carts all pursuing him to the President's house. . . . [W]e set off to the President's House, but on a nearer approach found an entrance impossible, the yard and avenue was compact with living matter." "But what a scene did we witness!" "But what a scene did we witness! The Majesty of the People had disappeared, and a rabble, a mob, of boys, negros [sic], women, children, scrambling fighting, romping. What a pity what a pity! No arrangements had been made no police officers placed on duty and the whole house had been inundated by the rabble mob. We came too late. The President, after having been literally nearly pressed to death and almost suffocated and torn to pieces by the people in their eagerness to shake hands with Old Hickory, had retreated through the back way or south front and had escaped to his lodgings at Gadsby's. Cut glass and china to the amount of several thousand dollars had been broken in the struggle to get the refreshments, punch and other articles had been carried out in tubs and buckets, but had it been in hogsheads it would have been insufficient, ice-creams, and cake and lemonade, for 20,000 people, for it is said that number were there, tho' I think the number exaggerated. Ladies fainted, men were seen with bloody noses and such a scene of confusion took place as is impossible to describe, - those who got in could not get out by the door again, but had to scramble out of windows. At one time, the President who had retreated and retreated until he was pressed against the wall, could only be secured by a number of gentleman forming around him and making a kind of barrier of their own bodies, and the pressure was so great that Col. Bomford who was one said that at one time he was afraid they should have been pushed down, or on the President. It was then the windows were thrown open, and the torrent found an outlet, which otherwise might have proved fatal. This concourse had not been anticipated and therefore not provided against. Ladies and gentlemen, only had been expected at this Levee, not the people en masse. But it was the People's day, and the People's President and the People would rule." Margaret Bayard Smith's account appears in: Smith, Margaret Bayard, The First Forty Years of Washington Society (1906); Leish, Kenneth, (ed.) The American Heritage Pictorial History of the Presidents of the United States; Seale, William, The President's House vol. 1 (1986). "The Inauguration of President Andrew Jackson, 1829", EyeWitness to History, www.eyewitnesstohistory.com (2007).